Lily, Drew and a Giveaway!! BEAR SEEKING BRIDE: DREW is available NOW!! Guess what? 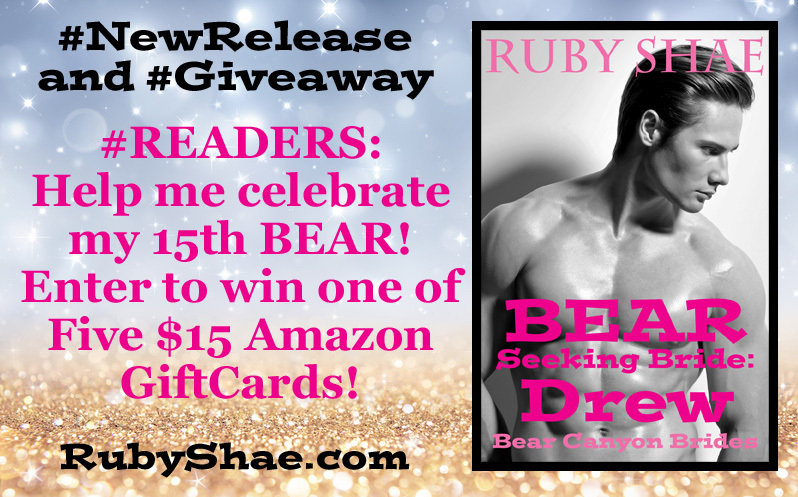 BEAR SEEKING BRIDE: DREW is my 15th BEAR!! To celebrate, I’m giving away Five $15 Amazon GiftCards! 1. Get/Read your copy of BEAR SEEKING BRIDE: DREW today! Where do Drew and Luke meet for lunch the day after Luke’s wedding? 3. Enter your info, and the answer, into the Rafflecopter (link below) for a chance to win!